Are You Experiencing These Tooth Infection Symptoms? If you have been experiencing a toothache, you may be putting off going to the dentist. While you may assume that your pain is mild sensitivity or a cavity, there’s a chance it could be the sign of something more serious. A tooth infection, or tooth abscess, is a serious dental condition which requires immediate attention. If you have been dealing with serious or prolonged tooth pain, then you should check to see if you may be experiencing these other tooth infection symptoms. If you are experiencing some or all of these symptoms, then you should schedule an appointment with a dentist immediately. A tooth infection, also known as an abscess, occurs when tooth decay, periodontal disease or a cracked tooth allows bacteria to enter the soft tissue of the tooth (the pulp). The infection can cause pus to build up at the root of the tooth in the jaw bone. This pocket of pus is called an abscess. Left untreated, an abscess can spread the infection to the surrounding tissues and the jawbone, which is very serious. If you suspect that you have an abscess, it is always better to get it checked out sooner rather than later. How is a tooth infection treated? How can a tooth infection be avoided? Brush and floss teeth regularly to avoid cavities and periodontal disease. Schedule an appointment right away if your teeth chip, crack or loosen. Visit your dentist regularly to catch any potential problems before they turn into an infection. If you are concerned you need tooth abscess treatment, or if you just want to take preventative measures to reduce your risk of developing one, then schedule an appointment today with Penn Dental Family Practice. 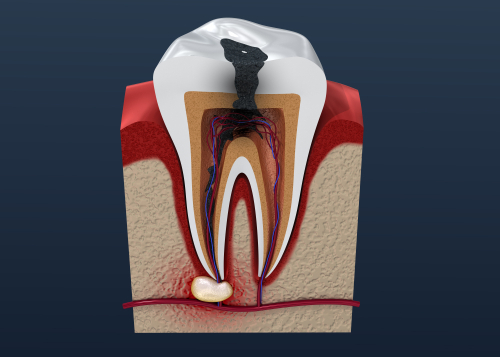 Our endodontic specialists will provide you with expert and personalized care. Call today at 215-898-PDFP(7337)!